The past few years have seen outrageous scandal circulating around the security of flash drives (remember Stuxnet?). The industry has sought ways to improve the technology while allowing it to become simultaneously more secure and flexible. Kingston Technology Company, Inc., a world renowned leader in memory products, has made some excellent strides toward that goal with the release of their new USB drive additions. The Kingston DataTraveler 4000 and the DataTraveler Vault will hopefully bring a much anticipated change. The Kingston DT 4000 boasts FIPS 140-2 Level 2 certification and offers one hundred percent privacy. It is touted as having military grade encryption capabilities, which features 256-bit AES hardware-based encryption in CBC mode. There is a complicated password protection device that forces a lockdown once ten failed attempts have been made. It has a tough, waterproof exterior, which is titanium-coated and tamper-proof. Another fantastic feature to this particular flash drive is that it is simple to set up. There is a complete absence of administration rights, and there is no application installation required. It offers the outstanding quality Kingston is known for, and comes with a standard five year warranty. Constant technical support is included in the package. It can be bought with up to 16GB worth of storage, and will be available in a centrally managed drive later in the year. The DataTraveler Vault – Privacy Managed (DTVPM) offers the same USB 2.0 connectivity as the DT 4000, but is available with up to 32 GB of storage. This particular flash drive is the brainchild of Kingston combined with BlockMaster technology. It offers direct management, otherwise known as over-the-web management. This kind of capability allows for such actions as remote password resetting and the ability to activate compliance audits. Compared to what has been previously available to consumers, these options are extremely flexible and cost effective. Kingston has been meeting the needs of portable memory device users since 1987. The company’s latest products are evolving with demand by producing two flash drives to meet a variety of needs ranging from general business use to medically confidential information and sensitive financial documents. As a result, 2011 proves that the USB industry is certainly seeing major strides in the security features offered through flash drives and other portable media. 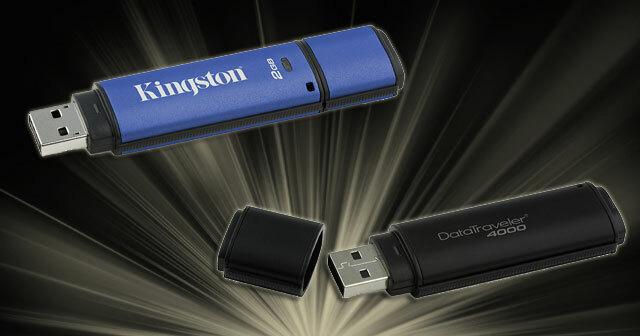 Do the new Kingston DataTraveler USB drives measure up to your security needs? Why or why not? This entry was posted in Articles, Flash Drive, Kingston DataTraveler, Kingston Technology, USB Flash Drives, USB Future, USB Stick and tagged 16GB flash drive, BlockMaster technology, DataTraveler 4000, DataTraveler Vault, Kingston DataTraveler 4000, Kingston DataTraveler USB drives, Kingston DT 4000, Kingston Technology, security of flash drives, Stuxnet. Bookmark the permalink.